A valuable gold coin from the early Islamic period was discovered during excavations in the Galilee town of Kafr Kana. Members of the Upper Galilee Leadership Academy rubbed their eyes in disbelief when on their first day at the Kafr Kana archaeological excavation, they discovered a valuable item. "While shoveling soil into the pan I saw a shiny coin. When I realized what it was I cried out and everyone was excited," says Dor Yagev, a pupil at the academy. 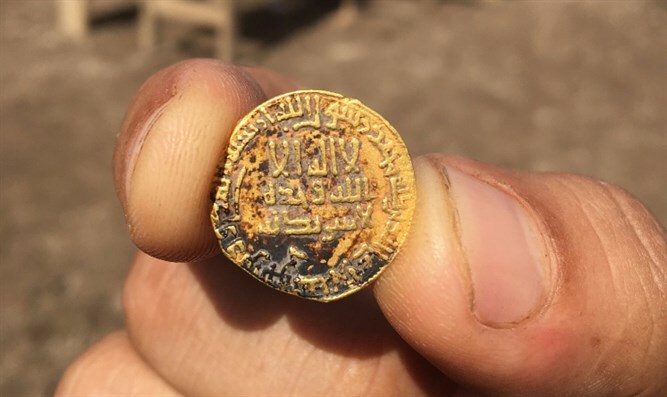 The pupils had discovered a gold coin from the early Islamic period, dating to 776-77 C.E., over a century after the Arab Islamic conquest of the Levant. The coin contained Arabic inscriptions portraying the belief in one god and the name of the prophet Muhammed. Additional silver coins were also found. In the last few weeks the Antiquities Authority has been conducting excavations together with pupils from paramilitary academies, before the construction of a new car park at the entrance to Kafr Kana. Dr. Robert Cole, a coin expert at the Antiquities Authority added that "The excitement was not just reserved to the pupils, it also affected the archaeologists as it is very unusual to find a gold coin during excavations. Just as today one doesn't just find a 100 euro note in the street, people guarded their gold then and it was passed down the course of time. When we find gold coins during an excavation, they usually are part of a treasure trove. One gold coin like this for an ordinary person was a huge amount of money. It was worth a hundred kilos of wheat and with just 4.5 dinar like these one could buy a house in the village." The excavations, as well as similar ones which took place in Kafr Kana over the last fifty years demonstrate the existence of early pre-Islamic villages in the area from the time of the Middle Bronze period (2000 B.C.E). as well as from Roman and Byzantine periods.